This waterfront hotel sits in practical location next to Festival Leisure Park and just across the road from Basildon Sporting Village. A firm family favourite with heaps of free parking. 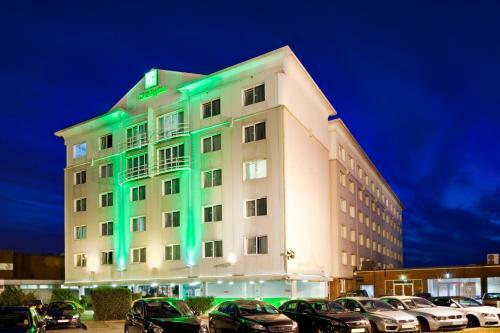 Whether you have appointments at Wickham or Apollo Business Park or intend taking the family to Tropical Wings Zoo or the Mill Meadows Nature Reserve the Holiday Inn Basildon could be a convenient (and very affordable) option. The generous landscaped gardens and reviving views of the lake make this a dreamy yet practical retreat. The M25 Motorway is just a ten minute drive and you have Basildon Sporting Village and Gloucester Park just across the road, one of the leading sports and leisure complexes in the area. The neighbouring Festival Leisure Park is home to a range of entertainment including a Fitness First health club, Empire cinema, and plenty of restaurants and bars. Southfields business park and the offices of Ford, CNH New Holland and First Data are all within a few minutes' drive of the hotel. The Junction Restaurant serves a solid daily schedule of British and International dishes and you can order meals to your room with our 24-hour Room Service . Children under-18 stay free with their parents when staying at the Holiday Inn.